Once you have an infestation, and have booked a bed bug exterminator to come within the next week, the worst thing you can do is sleep in another room away from the bed bugs. This sounds counter-intuitive, but the impact on the bed bug removal process can become more complicated. – Bed bugs are attracted to heat. Period.They will follow you and land in your new location within 1 day to 1 week, depending on when they last ate. If you decide to abandon your bedroom and go sleep on your bug-free couch in the living room, you will soon be dealing with a more complicated infestation: couches and recliner chairs are difficult to treat due to the multiple hiding spots inside. 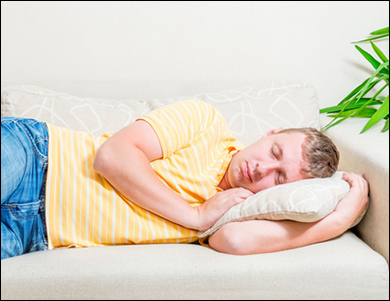 Once a couch or recliner becomes infested, you are limited to 3 choices: throw away, use a large mattress encasement (if the couch is not full size), or have your exterminator treat it thoroughly, and the surrounding base/floor area. In this case, you will need to abandon the couch (i.e. not sit or lay on it) for a few weeks in order to draw the bed bugs out. – If you decide to leave the house and go sleep at another location, the bed bugs will likely migrate to one of the other rooms where someone is sleeping or hanging out. If there is no one else in the home, after about 3 weeks, the bed bugs might take a longer journey if the temperature is warm enough, perhaps to an adjoining unit next door if you reside in a condo or apartment. On the other hand, when the temperature is cool, their metabolisms will drop down and are more likely wait until you return home for their next meal. You may have read that bed bugs can survive up to a year without eating. This is technically true, however, it doesn’t mean they will be happy to starve themselves for a prolonged period of time, nor be passive about it. Like any human who will fight and search for food in a time of crisis, these tiny parasites will be active and exhaust all options available nearby before going into hibernation mode and waiting it out. – If you are completely against sleeping near the infested area, while waiting for your bed bug treatment to be completed, there is one thing you can do to hold them off for a couple of days. Sleep with a light on and turn on a variable sound source such as music or a television softly in the background. This will let them know that someone is still awake. Bed bugs like to bite when the environment is dark, quiet, and completely motionless. Please be advised that while this strategy has proven to be effective in many cases, it is not a long term solution. After a few days, they will be desperate and hungry, and will venture out into broad daylight in search of their next meal. If you are lucky enough to book your exterminator for a treatment within a couple of days, then give it a try. The bed bugs will still sense your presence because of the body heat, so they will have no reason to venture to another room. They will be content to wait until another night or two, when all is quiet and dark. We hope this provides some insight into why additional problems can occur if you suddenly abandon your bed bug infested area. Your best option is to ensure you book a professional as soon as possible before the problem spreads into other rooms. Give Swift-X Pest Control a call anytime to discuss your current situation and get a quote. Also, make sure you follow the proper preparation steps before the treatment takes place.